The canary is particularly sensitive to toxic gases such as carbon monoxide which is colourless, odourless and tasteless. This gas could easily form underground during a mine fire or after an explosion. 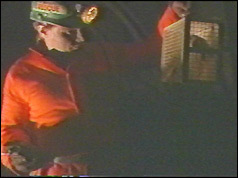 Following a mine fire or explosion, mine rescuers would descend into the mine, carrying a canary in a small wooden or metal cage. Any sign of distress from the canary was a clear signal the conditions underground were unsafe and miners should be evacuated from the pit and the mineshafts made safer. (...) Coal miners now rely on carbon monoxide detectors and monitors. Why do I blog this? this is an example of how miners found a trick for "measuring" some level of gases that might be dangerous. This concept is not so different from Beatriz Da Costa's blogging pigeons, which measure urban pollution.